Whether you need a new look for your hair, a new wig or some basic hair maintenance, Joni can take care of you in her home salon in New Prague, Minnesota. 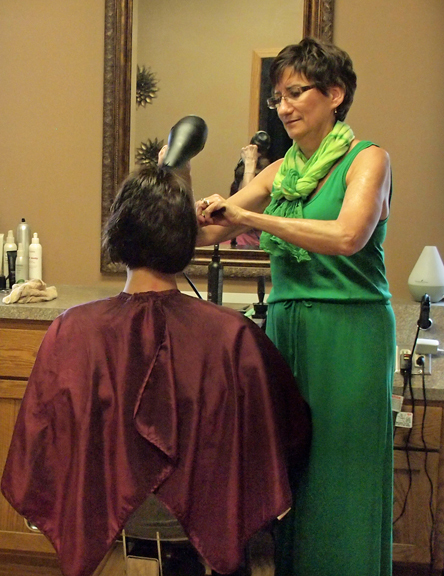 Joni has been a professional hair stylist for 35 years and has been taking care of clients of all ages in her home salon for 23 of those years. Joni is experienced and equipped to offer haircuts, hair color, perms, foils, dimensional hair coloring, waxing, special effect hair coloring and hair straightening. If you need a wig or some special head covering while you are undergoing medical treatment, JT Techniques has a wide variety of wigs, scarves, turbans and hats. Wig consultations take place in Joni’s private wig salon. Joni began offering wigs when two of her good friends had breast cancer. She teaches “Look Good Feel Better” classes at local hospitals as a special outreach that has grown from a special love and understanding that she has gained for women who are undergoing special medical challenges in their lives. For haircuts, Joni uses a range of tools to achieve the kind of style that her customers want. Joni suggests changing your style about every third haircut. Even if it’s just doing something different with your bangs or layers, Joni has noticed that the effects of changing it up a little bit can have a positive effect on mood and self concept. Contact Joni at JT Techniques to schedule your next hair appointment! Click here to order gift certificates for hair and wig, services and products.